Mythic Europe is a place of wonders. Ancient spirits live in the rivers and sleep under towns and cities. Merchants travel between those cities, bringing the mundane population together, while nobles fight and hunt from their castles of stone. The dead do not all rest quietly, and traces of ancient magic take an active interest in the present day. Yet still magi prefer to sit in their libraries and laboratories, oblivious to everything beyond the walls of their covenant. 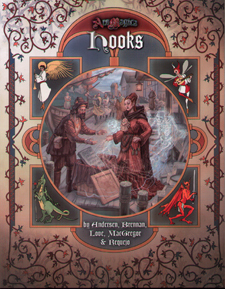 This book contains eight short scenarios for Ars Magics Fifth Edition tied to a previously released sourcebook. Each is designed to be played in a single session, and to draw the characters into some aspect of the rich background of Mythic Europe. Each scenario could serve as a single session's entertainment, or as the springboard for a saga arc.